This is where you can come to see my most recent crocheted inspirations, creations, and crazy designs. This one was made for Lou in Cambridge, MA. It has the symbol of his family name above the "sword" at his request. This was a house-warming gift for Jeff and Jill. Joey AS he is blowing out the candles. He had requested a Lego cake for his birthday and this is what I came up with. 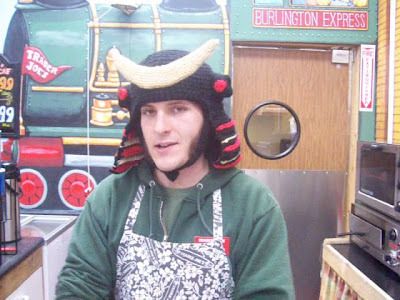 I have just finished this hat for Bryan at Trader Joe's in Burlington. I have learned a lot about Japanese weaponry and decoration because of this custom request. I have LOVED the challenge of making this cozy helmet. What's in my Etsy Shop. I see life as one big adventure. Some adventures are big (like living in Ghana and Togo for 6 months) and some are small (like designing and crocheting everything on this blog!). Yarn is my medium and I love to see what is possible to make with it. I am willing to sell anything you see. Some of my creations can be purchased at the boutiques listed below. Feel free to email me with any questions.